Lenders require a down payment on certain loans as a way to lessen their risk. History has shown that when borrowers make a down payment they are less likely to default on the loan. $22,500 is a sizeable amount of money for most people. Reducing that to only 3%, or even 0%, would save the buyer a lot of money. There are 2 specific loan programs that will allow qualifying borrowers to purchase a home without requiring a down payment. The VA mortgage and the USDA mortgage, which are both government sponsored loans. The Veterans Administration, or VA for short, oversees the VA mortgage program. This loan is designed for either current service members or people that have completed a specific amount of time in the service. Here are some of the highlights of the loan program. Not offered directly by VA offices – Many banks, credit unions and mortgage lenders are authorized to offer VA mortgages. The actual VA offices simply provide the guidelines for the loans. Available to current service members and discharged members – The VA has a list of service requirements for people that have served during peacetime, in war, and in the national guard or the reserves. No Private Mortgage Insurance – while most loans, such as conventional loans and FHA loans (discussed later) will require people to pay a private mortgage insurance fee each month if they buy a home with a small down payment, this is not the case with VA mortgages. 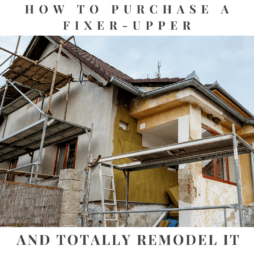 This can literally save the homebuyer thousands of dollars per year. Upfront fee – Although the VA mortgage program does not require monthly mortgage insurance, there is an upfront fee charged at the loan closing. Any person that is a military veteran or currently serving in the military should consider the VA home loan as their first option for buying a property. The United States Department of Agriculture, aka USDA, offers a home mortgage that is commonly referred to as the Rural Home Loan. This loan is open to all borrowers that qualify who wish to buy a home in a rural area. But rural does not mean what you think, as we will explain below. Here are the highlights of the USDA program. 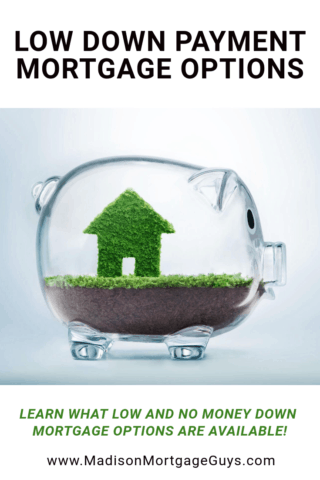 Allows for no down payment – the actual guidelines state that qualifying borrowers can receive a loan up to the appraised value or the home’s purchase price, whichever is lower. Lenient credit requirements – it is not necessary to have the high credit scores that are required for conventional loans. Eligible homes – in order to qualify for the USDA home loan, the borrowers must buy a property that is located within a region that is designated as rural by the USDA. According to a recent report from USDA, almost 97% of the current land mass in America is listed as rural. This means that almost every major town in the country has at least some portion which is eligible for the USDA loan. Designed for average incomes – According to the USDA, the borrower’s income cannot be more than 115% of the median income for that area. The qualifying income is calculated based on the number of people that will occupy the home once the loan is approved. Private Mortgage Insurance and purchase fees – The USDA requires 1% of the mortgage amount to be paid at loan closing. In addition, the borrower will pay 0.35% of the loan balance each year as private mortgage insurance. This amount is spread out over 12 months. People that are considering the purchase of a home outside the major parts of town should talk to a local lender and find out if they offer the USDA home loan. Several mortgage programs will allow borrowers to put as little as 3.5% down towards the purchase price of a home. Some of these programs also allow borrowers to use gift money from relatives for the down payment. The National Association of Realtors have reported that for buyers younger than 37, almost 40% use the FHA home loan to buy a property. The popularity of this loan comes from several factors. Eligibility – All US citizens are welcome to apply for the FHA loan. You are not required to be a veteran, or buy a home in a certain area in order to qualify. Credit requirements – Among all of the loan programs that will be discussed in this article, FHA has the lowest credit requirements. This does not mean that FHA will approve horrible credit scores for their loans. But it is easier to get approved for an FHA loan compared to most other types of loans. Down payment as low as 3.5% – FHA requires borrowers to pay 3.5% of the home’s purchase price as a down payment. However, all of the down payment money can come from either a non-profit agency or a family member. Monthly Mortgage Insurance Payments – FHA requires mortgage insurance to be paid two different ways. First there is a fee paid at loan closing. This fee is 1.75% of the loan amount and the fee can be added to the loan balance. Each year, 0.85% of the outstanding loan balance is paid as mortgage insurance. This amount is spread out over 12 months. The mortgage insurance is in place for the life of the loan unless the homeowner refinances the loan to a balance that is less than 80% of the home’s value. This is a great loan for a wide range of people looking to buy a home, whether it is their first home or their 4th home. The Conventional 97 is a program offered by Fannie Mae that is similar to the FHA loan. Eligibility requirements – people buying their first home, as well as repeat buyers, can apply for the Conventional 97. The program does not limit the income levels of applicants. Down Payment – The Conventional 97 requires borrower to pay 3% of the purchase price as a down payment. This money can be a gift from a relative. Credit requirement – The credit requirements for this program are more lenient than a conventional loan but not quite as lenient as the FHA program. Mortgage Insurance – Unlike the FHA and USDA programs, the Conventional 97 loan does not require a fee to be paid upfront when the loan is closed. However, for buyers that pay less than 20% down, there is a monthly mortgage insurance premium. The rate for the monthly mortgage insurance is determined by the borrower’s credit score. The rate can range between 0.75% and 1.5% of the outstanding balance per year. This loan is ideal for people with credit scores slightly better than the requirements for an FHA program. This is a 2nd program offered by Fannie Mae. It is a bit more flexible than the Conventional 97 loan. Income Limits – Qualified borrowers must have an income that is equal to or below the median income of their area. All applicants must complete an online education class before closing the loan. Down Payment – Borrowers are asked to pay 3% of the home’s price as a down payment. The money for the down payment may be a gift from a relative. Also, any money needed for the closing costs may also be a gift from a relative. Mortgage Insurance – like the Conventional 97 program, the monthly mortgage insurance premium is determined by the borrower’s credit score. Unique features – the HomeReady program allows various types of income to qualify for the loan. This program is ideal for people with lower income levels and extra income from non-traditional sources. Many states also offer assistance for their residents when buying a home. Some programs provide general counseling in order to educate buyers about budgeting, personal finance and preparing for home ownership. Other programs may offer a down payment assistance grant while other states may have their own type of low down payment loan. For example, the WHEDA program in Wisconsin in designed primarily for lower income individuals who wish to buy their first home. In Minnesota, the Start Up program allows people to borrow the money necessary for a down payment and closing costs. The state of Illinois offers their 1st Home Illinois in specific counties. This program allows for a down payment grant and is designed for first time buyers. Check with your lender to see if there are similar programs in your area and to find out what type of aid you may receive. Each loan that allows the use of gift funds will have specific requirements. Your mortgage lender can explain to you how the gift funds can be obtained and if there are any document requirements to verify the gift. Besides relatives, some loan programs also allow a down payment gift to come from certain non-profit organizations. 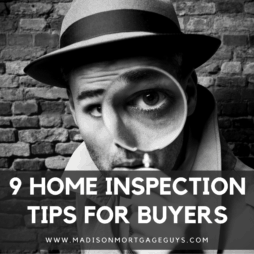 Once again, each loan will have slightly different rules so it is best to check with your lender and find out the guidelines for your specific loan. 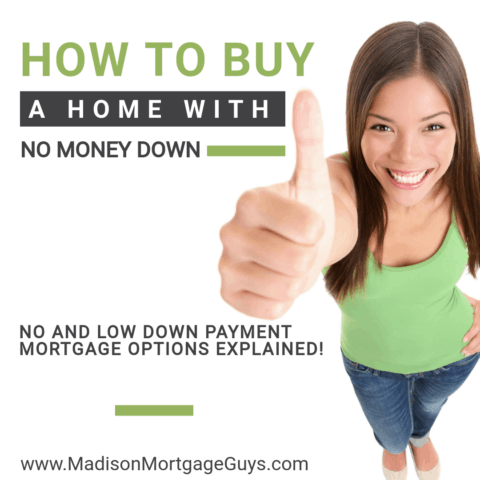 Is A Low or No Money Down Mortgage Right for You? Keep in mind that if you choose to make a large down payment (10% or more of the purchase price) then you may put yourself in a difficult position. 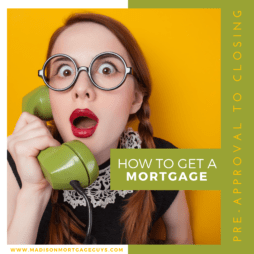 Using all of your money for the down payment and closing costs can put you in a terrible position in the short term if you need funds for an emergency such as a car repair, home repair or medical problem. 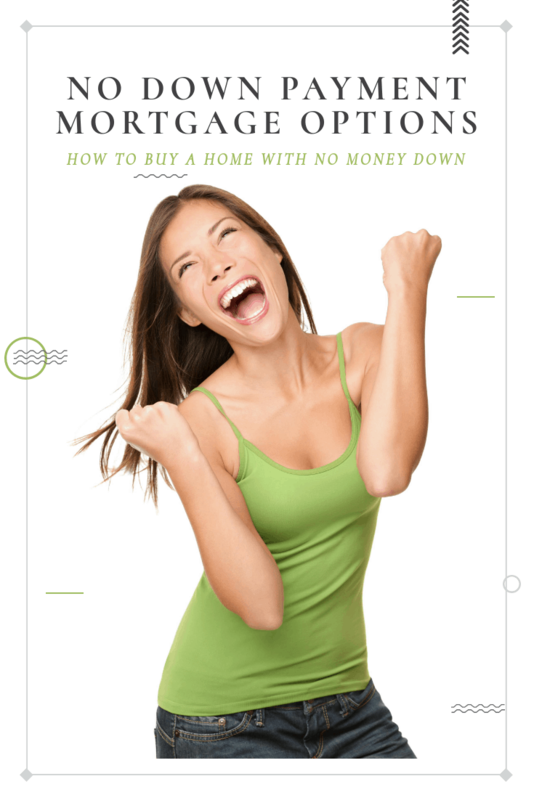 Of course, there are no down payment mistakes that should be avoided too! Learn more in the video below. For these reasons, it is always a good idea to consult with your mortgage lender and financial advisor before buying a home. These two professionals can help you look at your situation and guide you to make the best choice for your needs.